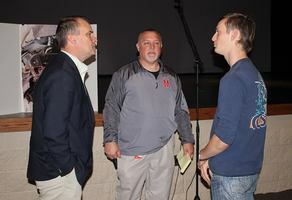 MHS PARTICIPATES IN 1 MILLION MEALS! 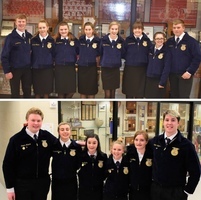 Mena FFA host Area Leadership Contest. 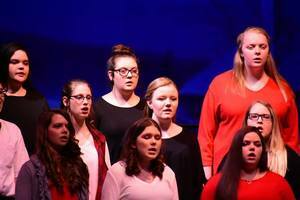 SeussOdyssey at the PAC ! 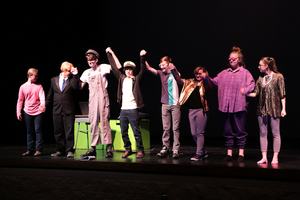 The Public performance of The SeussOdyssey by Don Zolidis was performed by Mena Theater students earlier tonight at the Mena High School Performing Arts Center. The first of many similar productions in the next couple of weeks... See you there! 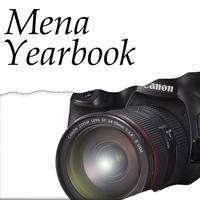 Mena F.F.A. 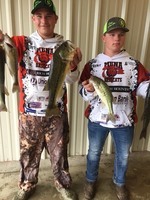 in Wild Hog Invitational! 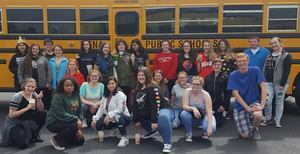 Congratulations to the Spotlight Singers for earning Superior Division I ratings in performance and sight reading at region choral performance assessment!!! 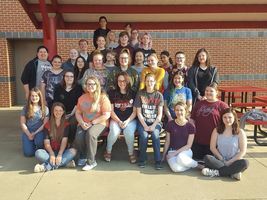 The ensemble qualified for performance at state CPA in April and has the opportunity to earn Best In Class and State Sweepstakes titles. 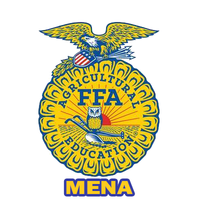 NATIONAL OFFICER VISITS MENA FFA! 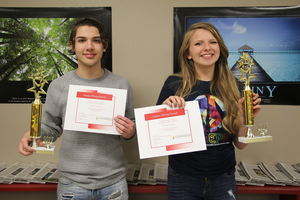 THOMPSON & NEUFELD ARE ALL STATE! 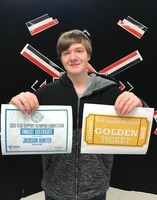 Congratulations to Christopher Thompson who made the All State Concert Band 3rd chair baritone and Fisher Neufeld is the best high school jazz pianist in the state of Arkansas, 1st band, 1st chair All State Jazz Band. 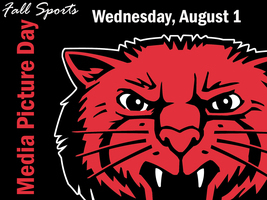 GO BEARCATS! 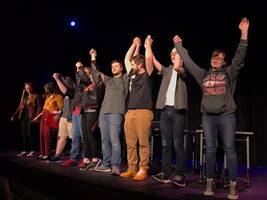 LUKE MONTGOMERY MAKES ALL STAR QUIZ TEAM! 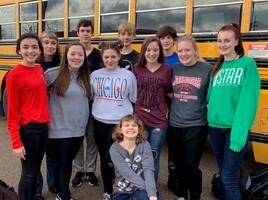 The Jr high Quiz Bowl team participated in the Jr high Regional tournament today at Ashdown. There were 8 teams. 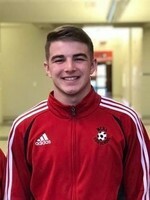 Although Mena didn't place Luke Montgomery did make the all star team . 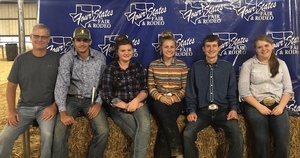 Participants were Luke Montgomery, Jasmine James, Daniel McDonald , Kate McDonald, Paige Parnell, Mackenzie Vincent, Jayden Felix, Carmen Puckett, Alexia Minzel, and Taylor Nance. 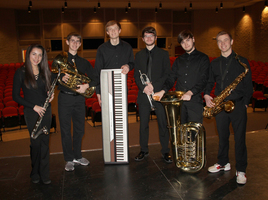 6 MENA MUSICIANS MAKE 4 STATES BAND! Winter Formal will be February 9 at Suzie Q's from 8-11 pm. 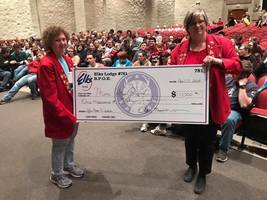 The cost for Seniors is $15.00. 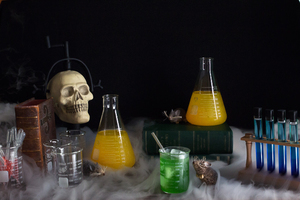 If you bring a guest, it is an additional $5 (total $20). Guests can be 9th grade thru 21. Semi-Formal dress. 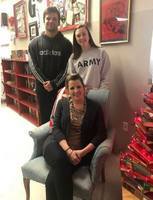 Students may pay Mrs. Thacker or Mrs. Hobson. 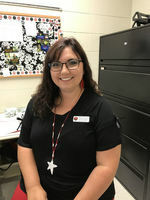 GATES IS MHS TEACHER OF THE MONTH! 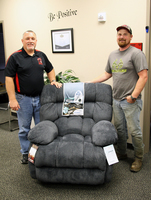 HENDRIX RECOGNIZED BY LOCAL VETERANS! 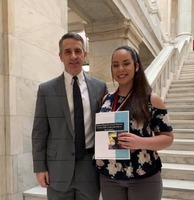 Ms. Annita Hendrix, Mena High School history teacher, was awarded a Certificate of Recognition by the local chapter of the Veterans of Foreign Wars this morning. This certificate of recognition was given in honor of the service and dedication Ms. Hendrix gives to her community. JR. HIGH ALL REGION JAZZ BAND! 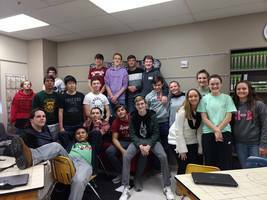 JR. QUIZ BOWL COMPETES AT ASHDOWN! 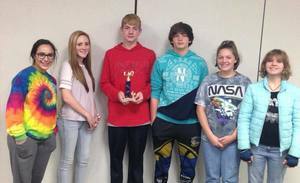 The Mena Jr. High Quiz Bowl team placed 4th today at the Ashdown Invitational Quiz Bowl. 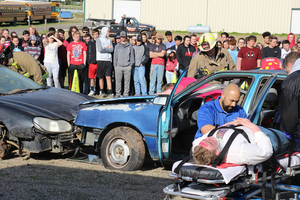 There were 9 teams participating.GO BEARCATS!!! 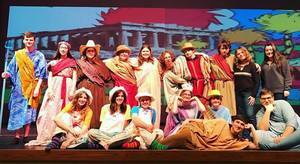 OZ IS A HIT ! 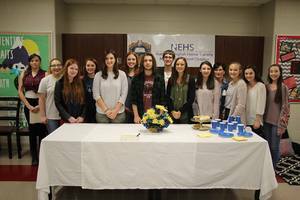 The Mena High School Chapter of the National English Honor Society held their 2018-19 induction ceremony this morning, welcoming in their newest members to the chapter. 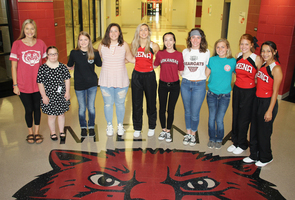 New member inducted today were Emiley Sorge, Halie Standerfer, Ivy Curtis, Summer Loar, Kara O'Donnal, Cori Hilton, Alexiza Lawrence, Shylee Head, Haley Hooper, and Esmerelda Johnson. 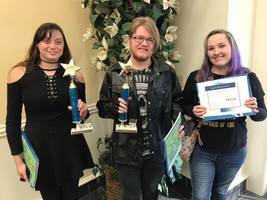 MENA STUDENTS WIN AWARDS AT SAU!!! 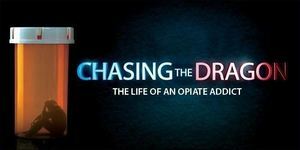 OZ THIS SUNDAY & MONDAY ! 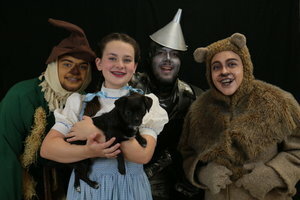 The cast of "The Wizard Of Oz" ran thru dress rehearsal earlier this week... Public Performances Sunday - Nov. 11 @ 2:30 pm Monday - Nov. 12 @ 7 pm Admission $5 MMS Performance Tuesday - Nov. 13 @ 8:30 am Admission $2 HHES Performance Wednesday - Nov. 14 @ 12:30 pm Admission $2 MHS Performance Thursday - Nov. 15 @ 8:30 am Admission $5 .See you there!!! 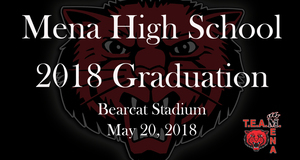 Prior to the Mena Bearcats 49-0 win over Waldron the community gathered for the 2018 Homecoming Ceremony at Bearcat Stadium HALIE STANDERFER.. named this years maid of honor & HANNAH MCDONALD was crowned queen.. Congratulations to the entire court.... GO BEARCATS !!! BAND ON 10 YEAR STREAK! 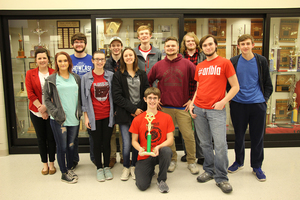 Congratulations to the Mena Bearcat Marching Band for receiving a First Division Superior Rating at the Region VIII Marching Assessment for the tenth consecutive year! 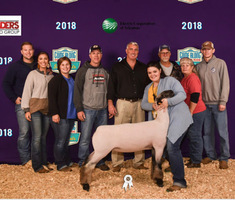 MENA FFA AT NATIONAL CONVENTION! 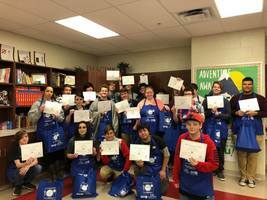 Presenting the 2018 Graduates of the UAEX Cook Smart, Eat Smart program. 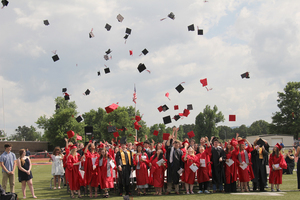 Congratulations and great job students! MENA CHOIR AT REGION WORKSHOP ! 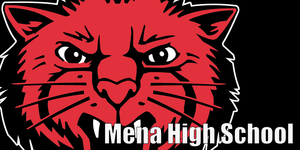 The Mena Bearcat Homecoming Dance will be after the Football Game Friday night October 19th. 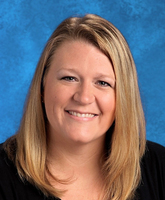 The Dance will go until 11:30pm in the Mena Middle School Cafeteria. 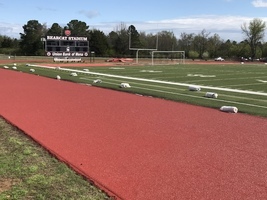 Admission is $5.00. 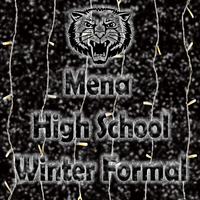 Mena High School Students only will be permitted at the dance. There will be drawings for prizes during the dance. 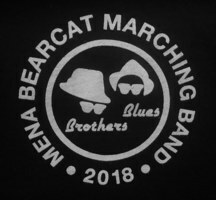 Your next chance to see the Mena High School Marching Band perform at Bearcat Stadium will be Friday October 5th during halftime of the Mena/Dover football game.. Don't miss this great show featuring the music of the Blues Brothers..
MENA STUDENTS AT FOUR STATES FAIR ! 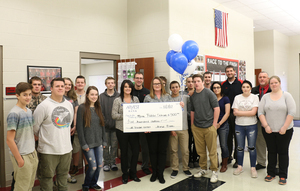 A new range/oven has been donated by Rich Mountain Electric to the Mena High School Family and Consumer Science (FACS) Department. 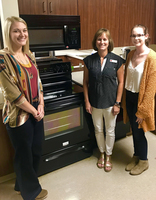 Pictured with the new range/oven are FACS Teachers Ladatha Hobson and Kristi Wilson, and Senior Lindsey Logan, FCCLA President. 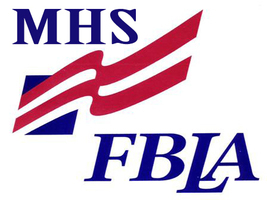 The Mena High School Flu Shot Clinic will be held on Tuesday, October 9, on the MHS campus for any students and school personnel who wish to get a flu shot. 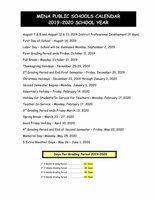 Forms are available for students to bring home to parents, and these forms will need to completed and returned to the high school by Thursday, September 27, for students to get their flu shot on October 9. SENIOR DAY AT UARM ! 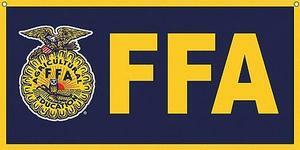 Mena FFA Meat and Fruit Sale starts This Tuesday. 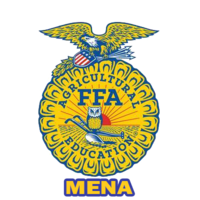 Anyone who is interested in purchasing FFA Meat or Fruit products and have not been approached by an FFA member call Mike Collins and Bryan Maye at Mena High School or Justin Goodnight at Mena Middle School. 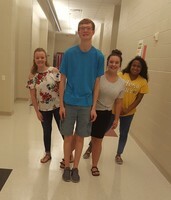 Bearcat Chorus officers for 2018-2019 are Fisher Neufeld, President; Hannah Willis and Brithney Dilbert, Co-Vice-presidents; Alyssa Scott, Secretary. 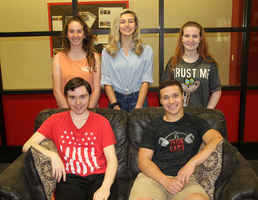 The officer team has adopted #bekind as their message for the year. 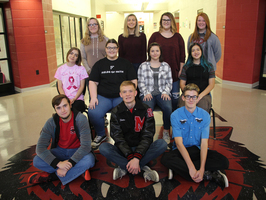 The Spotlight Singers leadership team. 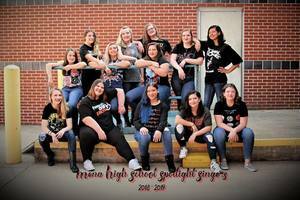 The Spotlight Singers leadership team for 2018-2019 is our four seniors; Brooklyn Beck, Sumer Brown, Mackenzie McAlllister, and Hannah McDonald. 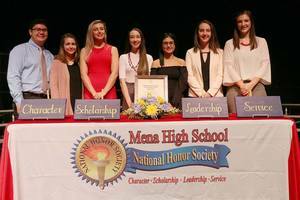 Brooklyn, Mackenzie, and Hannah serve as sections leaders and Sumer is in charge of all administrative responsibilities. 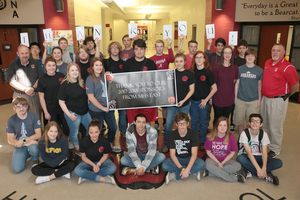 MHS EAST Says "Thank You"
The Mena High School band performed in the annual Region VIII Concert Band and Sight Reading Assessment at Alma High School on Thursday, April 5. 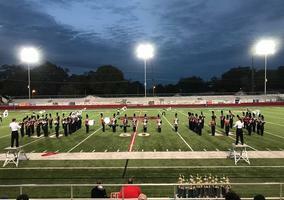 The band received straight 1st Division Superior ratings. 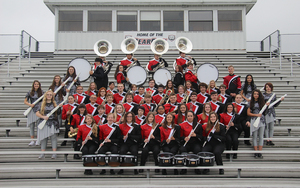 This score combined with the marching band scores make the Bearcat Band a Sweepstakes Band for the 2018 school year. 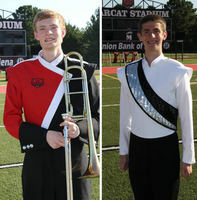 Congratulations to the Bearcat Band. 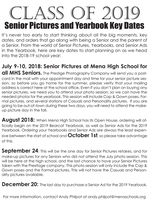 For anyone who is still interested in ordering a 2018 Senior Shirt, tomorrow will be the deadline to place your order. Shirts are $15 each, and you can pay with cash or check in Mr. Philpot's Room 205 at the high school. The shirt order will be submitted at the end of the school day tomorrow! 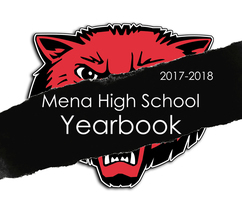 The Yearbook staff is now taking orders for the 2018 Senior Shirts. These shirts can be ordered between now and March 30, and they are $15 each. 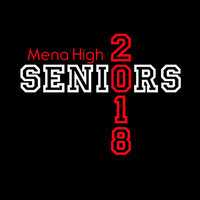 To order your 2018 Senior Shirt, see Mr. Philpot in Room 205, and payments can either be cash or check. If you're paying with cash, please have exact change if possible. 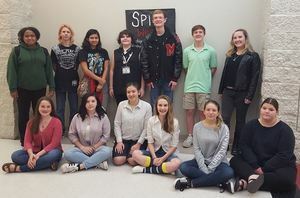 Students and staff from the Independent Living classroom at Mena High School are helping the campus with their efforts of recycling. 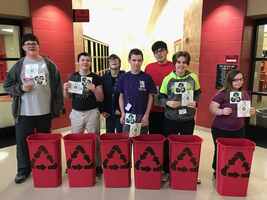 On Tuesday of this week, the students put red recycle containers at various locations in the hallways, which can be used for anyone on campus to deposit their empty plastic bottles and aluminum cans. The 2018 Polar Plunge scheduled for this Saturday, February 24, at Lake Wilhelmina, has been postponed due to the excessive rainfall this week. The ongoing rainfall has lake levels higher than preferred, and until the levels recede, it is deemed unsafe. 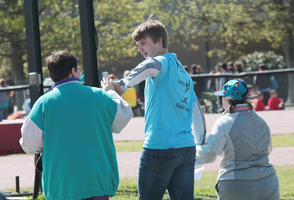 A new date for the Polar Plunge will be announced once it is determined. 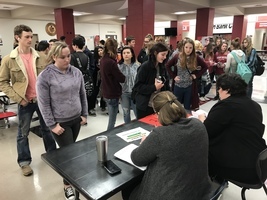 Monday morning, January 8, Mena High School students and faculty reported back to school to start the spring semester, after two weeks off for Christmas Break. Students started their morning by picking up their schedules for this semester.